b-year birth year m# mother's record no. b-m birth month f# father's record no. d-year death year s# spouse record no. John O'Connor: 1939 - 2002 was the family historian untill his death. The historical O'Connor portrait photos were in the possesion of Elizabeth (Beahen) O'Connor : record no.3. After her death John learned of the photos from me and obtained them from our Aunt Veronica record no. 41. Using John's information I built the first electronic version in 1986 From John's records. I photocopied all John's records and photographed the historical O'Connor family portrait photos which I later didgitized in the late 1990's. I built this version and uploaded it to my tinmangallery site in 1999. Note: record no. 68 Douglas Reid family name originally Lavoie (Eastern Ontario?) - (Doug's father and brother) unoficially adopted by Reid family after parents died some time in the 19th century. It was common for farming families to take in orphaned children and then for the children to assume a new name. Information provided by Douglas Reid. Note2: record no. 39: John Henery 1899-1963 (My father) married a second time to a ROY she had three young children: Michael, Helen, Clare. Michael and my father became very close in his later years. His hopes for a professional future as an architect were ended by the depression. He was lucky to have worked during the depression as a cabinet maker specializing in antiques. After my mother died in 1939 my father raised my siblings as a single parent with the help of his parents. Being an infant I was raised by his mother. He worked at his job and in the evenings during the war worked in the war industry. I recall him trying to introduce a potential mate to his children but my older siblings were adamant that no one was going to parent them. It took until his children left home before he could settle down with a mate. None of us hve the power to go back in time and change events that we like or don't like. We are what we are at this continuous present moment in time. The past was a form of now, the present is a form of now and the future is a form of now. That is the paradox of nowness. in my branch but may be usefull for other branches. Elizabeth Goulden # 11: death due to after-birth infection: (Keith was a breech-birth) no D&C performed in 1939.
her mother: Taylor # 78: 19 pregencies only 7 survived full term. her father: goulden: came from a large sibling family of which 9 survived. ruptured heart - smoker-coronory thrombosis ? x-child & adult smoker - aggrivated bowel syndrome - consider the probability of CROHNS associated symptoms - weight problems -(birth defect gimp neck), eyesight problems: glaucoma - cataracts - legally blind one eye - blood pressure varies as much as 32 points within 10 min: dignoses:hypersensitive to white coat effect - heel spur - touch of asthma - enlarged prostate - good bone density - good knee joint pads. Keith: GC: 54: Over the first decade of the 21st century I have projected my growing understanding of Tourretes and Aspergers symptoms onto memories of both myself and my siblings childhood and adult behaviour. A comparrison of these symptoms with my memories indicates a genetic influence on my intellectual and emotional interactions with others during my life as well as those of my siblings. I have noticed Asperger like symptoms in the mine and my siblings children. The presence of my birth defect - gimp neck - which was corrected by a pre-teen operation strongly indicates possible genetic reproductive problems in the womb. Memories of my siblings indicate that they also came under the same genetic influence as myslef. Unfortunately my siblings departed this life before ever becomming aware of these influences on their own behaviour. It is quite possible that the presence of these genetic tendencies were one contributing factor to the conflicted relationships between and among my siblings. My conclusion is that if I and my siblings could not escape being influenced by these genetic tendencies then neither can our children. An awareness of these symptoms and the ability to self-therapy (a self reflexive consciousness ) can provide procedural solutions and thus normalize interaction with others. - recognize that a part of you wants one thing and another part can assess the probability of reasonableness in terms of life experience and make the correct decision. Remember there is a difference between genetically driven behaviour and personality disorder. It is extreemly difficult to self recognize these symptoms or accept others pointing them out. 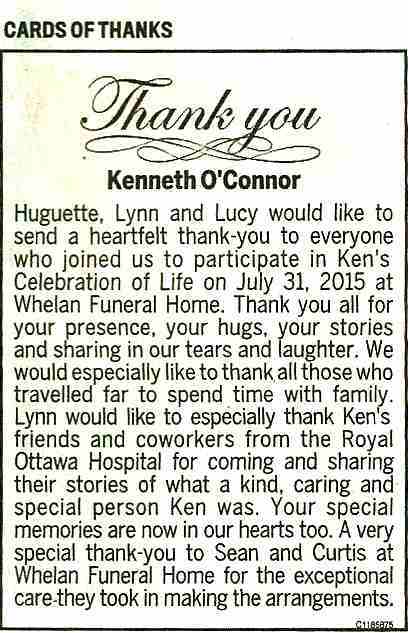 Supplementary note for Kenneth O'Connor: GC: 55: 1958-2015 record no. 51 son of Rodrick O'Connor: record no. 50. Enlarged heart / heart attack. The day you left him with me he did deteriorate before my eyes. It is in my journal too, he was very scared and had THE TALK with me! Sounds good - point two - that was it and was why he died so quickly - seems once it hits its pretty aggressive and would have already gotten worse by the time they they turned off the breathing device - it had only started a couple of weeks before - even the day I left him with you - he must have deteriorated before your eyes - when I got home I had to phone the ambulance and that was the last time he was at home. I don't think they really got how fast this was all happening or at least they didn't know what it was until maybe the very end or after even. The RT in emerg told me he was only alive because of the breathing machine (pretty brutal at the time) since he posed it as a question as if it were my doing - that was one clumsy RT. He must have thought - another old guy with COPD just trying to hang on but until a week before there was no sign of lung disease. Bob like everyone else didn't know what was going on and was going to give it his best shot. A doctor in emerg asked me if we had had THE TALK but it was all new and unexpected to me. He would have died in the ER but they gave him a slim chance because they didn't know what was going on and kept him going. I drove very fast to the hospital and it was not long after before the Doctor was ready to speak with us. He sat us down in front of Dad’s cat-scan results and explained it all to us visually so we could see with our own eyes. Dad’s tumor that he has would give him approximately 6 months to live if he had no other problems. And with this tumor there is nothing they can do, no radiation, no surgery. Some patients will die earlier and some may last a little longer. Dad also has a lung disease and they do not even know what it is. They have exhausted every possible treatment they can to try and clear up some of the lung damage without success. The damage is extensive and it is on both lungs. What the medical team is going to do is take Dad off life support tomorrow morning at 9am and bring him out of sudation so he can spend whatever time he has left with his family, and hopefully be able to communicate with them. The doctor would also like the chance to explain to Dad what is happening to him if he is capable of understanding this. The problem is they do not know what is going to happen when they take Dad off support, he could only have a few minutes to live or he may hang on for a while before leaving us, however he will not feel any pain as they will keep him comfortable.